During its heyday one hundred years ago, the American circus was the largest show-biz industry the world had ever seen. 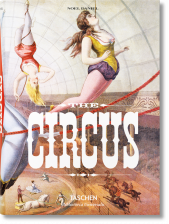 From the mid-1800s to mid-1900s, traveling American circuses performed for audiences of up to 14,000 per show, employed as many as 1,600 men and women, and crisscrossed the country on 20,000 miles of railroad in one season alone. The spectacle of death-defying daredevils, strapping super-heroes and scantily-clad starlets, fearless animal trainers, and startling freaks gripped the American imagination, outshining theater, vaudeville, comedy, and minstrel shows of its day, and ultimately paved the way for film and television to take root in the modern era. Long before the Beat generation made “on the road” expeditions popular, the circus personified the experience and offered many young Americans the dream of adventure, reinvention, and excitement. "This mammoth 670 page compilation of circus imagery is stunning in size and scope... 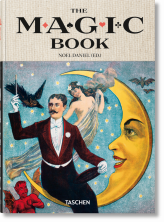 This is the ultimate Circus book!"